We are a leading Manufacturer of fancy suits for party, party wear suit, ladies suits, fancy suits, fashionable party suits and sarg kaisha from Delhi, India. We are prominently ranked amongst the topmost manufacturer, trader, wholesaler and supplier of Fancy Suits for Party. We offer a wide choice of gorgeous fancy suits in fabulous design, sizes and pattern. Attractive embroidery work on these fancy suits makes them classy, designed using advanced technology by our experts. 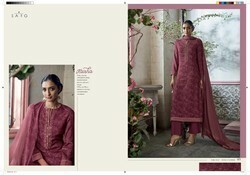 Owing to their varied quality features, these fancy suits are highly appreciated in the market. Clients can avail these fancy suits from us at market-leading prices. We are offering a quality assured collection of Fashionable Suits. The ladies suits offered by us are comes in varied designs & sizes as per the need of customers.